Today: Taylor Holliday of The Mala Project brings the heat with a homemade black bean and shallot chili oil. Around this time last year, my family and I were eating our way through Sichuan's capital, Chengdu. Determined to take the amazing flavors back home with us, we bought some chili oils from a street vendor. These were not your everyday chili oils, but rather magnificent, umami-rich concoctions packed with preserved black soybeans, an array of nuts and seeds, aromatics, Chinese five spice, and Sichuan pepper. More: Know your chile from your chili. Here's everything you need to know about hot peppers. They were a bit like the famous and fabulous Lao Gan Ma chili oils that you can buy in Chinese markets worldwide, but their flavor was different in the same way homemade ketchup is to Heinz. Needless to say, even though I zealously rationed them, they are long gone. Luckily, before they disappeared completely, I began to work on recreating them. I'll never know all of the secret ingredients, but here is my version of one that contained black bean sauce with crispy shallots. The saltiness of the black beans is balanced by the sweetness from the crispy shallots, with a kick from crushed dried red peppers. You can use this chili oil as a condiment on just about any Asian food: Mix it with equal parts soy sauce for a great noodle sauce, or try it with some Zhenjiang black vinegar as a dumpling sauce. Heck, I even go Western with it, oven-roasting potatoes or cauliflower in it. *You should be able to find preserved black beans (douchi) at any Chinese market. Look for ones labeled Yang Jiang, named for the city in Guangdong Province that makes the most famous douchi. Yang Jiang black soybeans are salted and fermented with ginger, and this brand, at least, must be smoked because the beans have a distinct hint of smoke. Some people rinse them before use, but I just run a knife through them for a rough chop. **The kind of red pepper flake used in chili oil makes a big difference. Sichuan chili flakes are the best, but are difficult to find outside of Sichuan. Although you can find whole, dried Chinese red peppers in the U.S., I don't recommend processing them to make flakes for this recipe; they are difficult to de-seed and grind into flakes that are fine enough for this purpose, and their jagged edges are unpleasant. 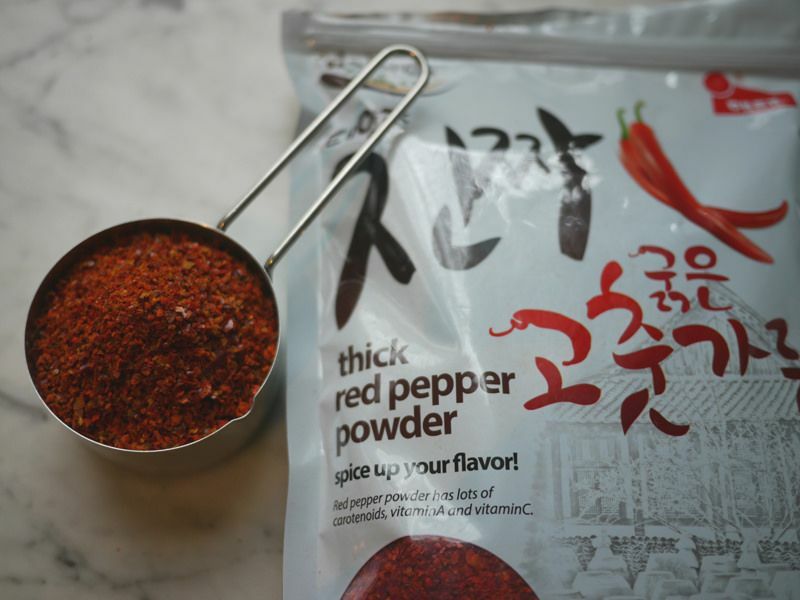 Instead, I recommend using coarse-ground Korean red pepper flakes, which is easy to find and, while not as bright red as Sichuan chili flakes, have a similar color, texture, and medium-hot heat. Just made sure it's coarse, and not fine powder. To make the chili mixture, layer the dry ingredients in a heat-proof pint canning jar with a tight-fitting lid. Put black beans in first, then red pepper flakes, salt, sugar, and spice (if using). Set aside. 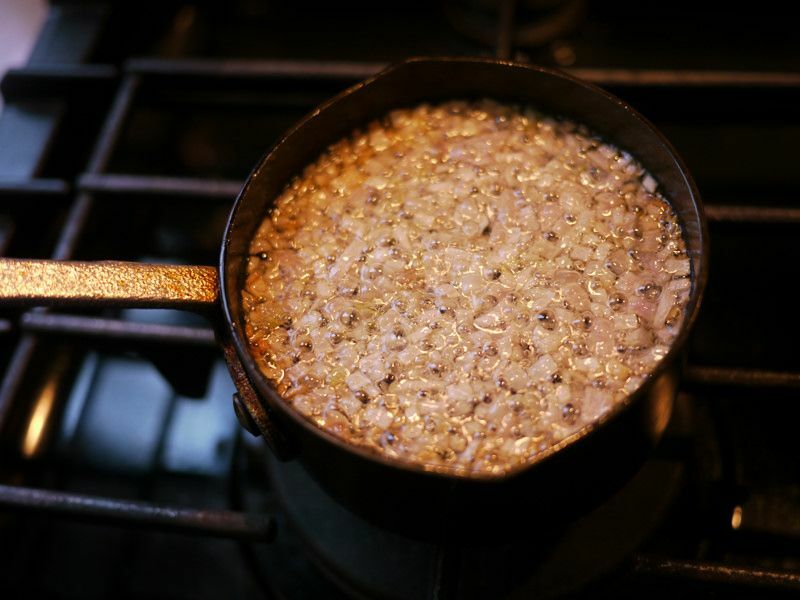 Add the peanut oil to a small saucepan and heat over a medium flame until hot. I like to use China- or Taiwan-made peanut oil because it has a more peanuty taste than the American version, but you can use any peanut or canola oil. To test if hot, place one small shallot bit in the pan. If the pan is hot enough, the shallot bit will sizzle when it hits the oil. Add the shallots and fry until they start to brown. Do not burn the shallots, but keep the oil at a fast bubbling simmer. When shallots are just golden, immediately transfer the hot oil and shallots to a glass measuring cup. Immediately pour the oil and shallots from the measuring cup over the jarred red pepper flake mixture. The flakes should fizz and sizzle, getting a light toast from the hot oil. Allow to cool, then stir the mixture until well combined. Leave to cool and settle, and enjoy immediately or store in a cool, dark place. The mixture will taste best after it's infused for a few days, and will last for roughly a month. looks pretty darn authentic to me! You might try visiting it before you critize her or her abilities too much! Thank you for taking the time to document your Sichuan experiments and experiences. All suggestions about creating Lao Gan Ma chili oils are gratefully received. Just a note that this recipe is for Sichuan-style black bean chili oil. The editors renamed it just Sichuan Chili OIl, which is a tad misleading since the standard Sichuan chili oil does not have black beans. This is a variation. The traditional is on my website. Thanks! Taylor, this recipe is very tasty.After reading the comments, I decided to use my dried Sichuan peppercorns in lieu of the 5 spice. I'll experiment next time with the 5 spices and see which I prefer, and let you know. I made a half batch yesterday and have eaten it twice in less than 24 hours.It will be gone before it has time for the flavors to meld , as you suggested. Luckily I have a great Chinese market, Mr Chen's, nearby in Montgomery,AL. Mr. Chen's had the flavorful peanut oil and the exact brand of black beans shown in your picture above.What a funky ingredient!!! Nothing tastes like it ,or smells like it, either. I cook with American peanut oil for its high frying tolerance. I had no idea how much flavor is "refined" out of our oil. The Chinese peanut oil is almost as rich and flavorful as sesame. Another new find ! We have a huge Korean community in Central Alabama,so I have been enjoying the various red chile blends I find in the markets.You are right,Korean flakes are much better than any powder, and worth buying online if you cannot find gochugara in your local market. The brand I like is MILKimchee Gochugara. I laugh every time I see MILKimchee on the label...the vendor who sold it to me told me it is the best because " Mothers in Law" use it to make their special family kimchees.They even have a MILKimchee website...NJOY!!! So glad you liked it! I agree that Korean chili flakes are the best substitution for Sichuan flakes, and much easier to find in the U.S. South, with our large Korean communities. 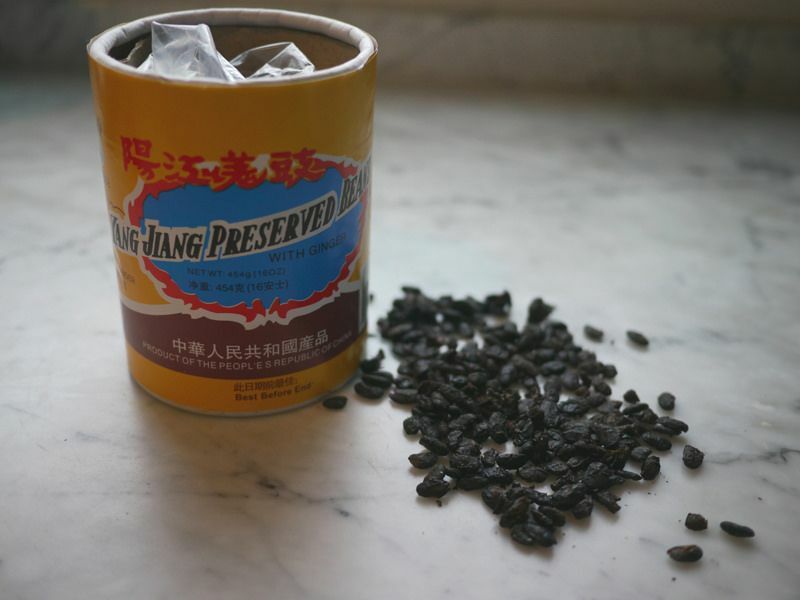 I would add two things: Before editing, the recipe specified GROUND, roasted Sichuan pepper; it also mentioned that my favorite brand of black bean is Pearl River Bridge, which is less smoky than the brand pictured. In any case, it sounds like you'll be experimenting and finding your own perfect combination. Thanks for letting me know! Your recipe is a chili oil. That is for sure. At issue is "Sichuan". Adding preserved black beans to chili oil is a favorite among Chinese and Koreans, but probably not much beyond. The secrete of preserved black beans is twofold. First they deliver two ultimate flavors to your palate: saltiness and umami. Think anchovy for Italians, but for carnivores and vegetarians both. Second, they reduce the intensity of the heat of the chili peppers, making the oil much easy access to a lot more people who have been tempted to try spicy and flavorful sauce. In case you did not realize the extraordinary power of the black bean chili oil, you know how much you miss. Which is what makes your recipe good. In fact, in the neighboring province of Guizhou, people prefer black bean chili oil to Sichuan chili oil. A most notable story has been one factory worker, after being laid off many years ago, decided to try her luck making a black bean chili oil, trademarked "Grumpy Grandma". The brand was so successful it took over China and made her one of the richest women in China (think hundreds of millions of US dollars). (You can buy it here in the U. S.) It is pretty clear plenty of people in Sichuan love this sauce too. So if you (and Lisa) found this all over the shelves in any place in China, it is only expected. By contrast, there is no major brand of Sichuan chili oil in China at all, not even at a fraction of the size. As for Sichuan, there are two types of hot oil: Sichuan pepper oil and Sichuan chili oil. 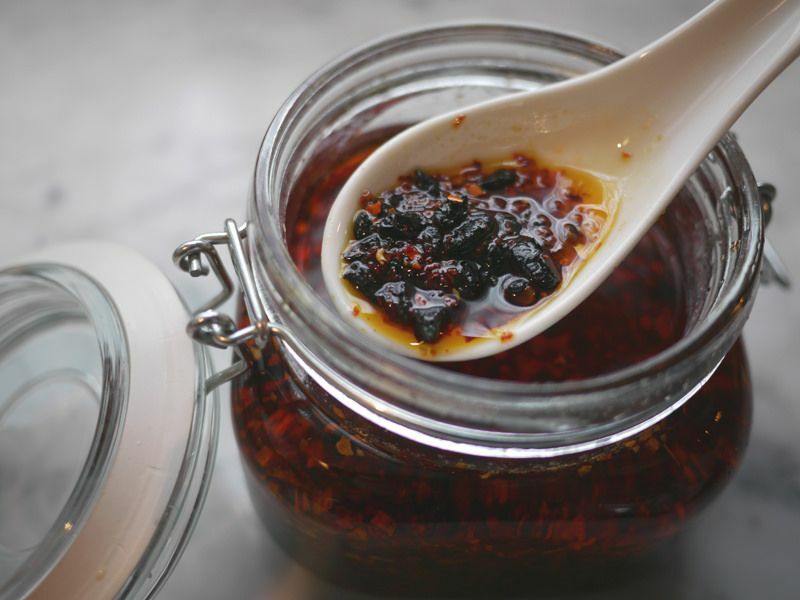 Sichuan peppercorn oil uses Sichuan pepper, the iconic peppercorns bearing that name, giving the numbing effect (ma). It is recognized nationwide and widely beloved, but only consumed moderately. You find national brands, but only at a fraction of Guizhou black bean chili oil. Sichuan pepper oil is clear, with the Sichuan peppercorns removed after being infused into the oil. The other oil, Sichuan chili oil, is chili flakes plus oil. I don't have any knowledge of any significant national brand for this at all. When people eat it, they either go to a restaurant or make it themselves. It may surprise you. The essence of the Sichuan chili oil is pure fire, the heat. It is made usually with the chili flakes left with the oil, sometimes very reddish, with a nickname "red oil". Of course, when you make you own, it is up to you to decide on the intensity of the oil and choose the amount of chili. It is also common for people add some Sichuan peppercorns (just like in your recipe) and perhaps some spices, into to. But probably not herbs (like onions). Despite I had never been to Sichuan (what a shame), I did try out one authentic Sichuan restaurant in Beijing. The Sichuan chili oil it served was so intense that I felt the heat (not from the high temperature of the plate or the food, but purely from chili oil as its heat radiated through air-no kidding). I was pretty embarrassed and asked the waiter to bring back the chili oil; the dish itself was already hot enough (for me). This may shed some light why Sichuan chili oil is consumed only lightly and by some small number of people. So I would say your recipe is a black bean chili oil, not Sichuan chili oil. But as I said above, black bean chili oil has a character of its own and is indeed very good. A few more comments about you post. First the choice of chili flakes. Chili flakes are the right choice. They have the heat. But Korean chili powder is not a good choice at all. For whatever reason, Korean chili powder is not hot at all. Please note the picture in your post is not chili flakes, but chili powder. Yes I have tasted the exact bag. You can still use it. 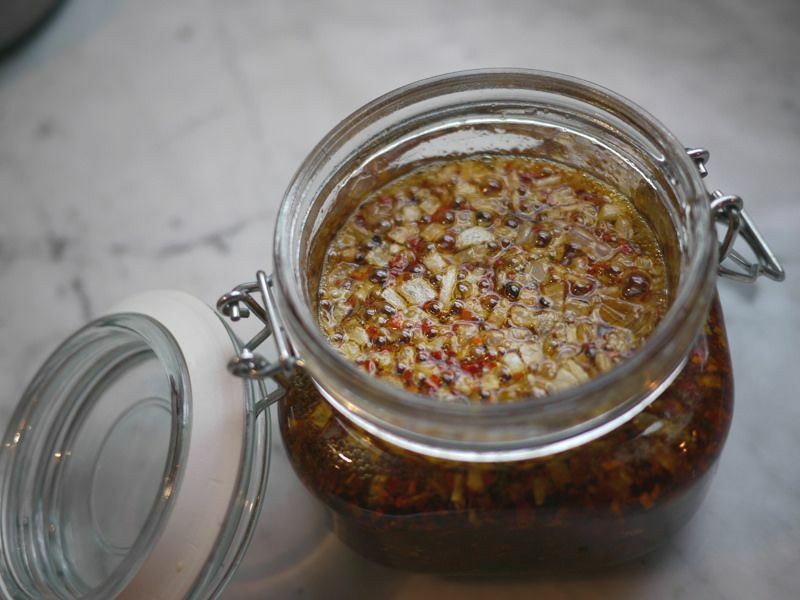 But you will miss the key aspect of Sichuan chili oil. Second, think carefully about adding shallots and, especially sugar. Sugar Americanizes it. BTW, the preserved black beans are usually pretty salty, so not sure you need additional salt. Third, it is not a good idea to use peanut oil, in particular Chinese peanut oil. Unlike American peanut oil, Chines peanut oil contains the peanut's original flavor, very aromatic. But it is the wrong choice as it is either lost in the strong chili and black bean, or in conflict with them. Vegetable oil is what Sichuan people use and is usually fine. In case you want peanut flavor, you add roasted peanuts to the dish. George, whenever, you DO make it to Sichuan, go to the lanes around Wenshu monastery in Chengdu and you'll find a famous stall that sells about six kinds of SICHUAN BLACK BEAN chili oil, made in SICHUAN. Okay George, so how does going to one "authentic" Szechuan restaurant in Beijing and doing some research (likely from random googling online) make you qualified to lecture everyone on this topic? This was insufferable to read and you should get off your soap box. Hi George, it sounds like you are well versed in the area of Chinese cooking so I do find your comments helpful. Thank you. I'm Korean and by no means an expert on any cuisine but I do know that ground Korean chili comes in all levels of spiciness. The spicier and redder varieties are more expensive and more popular. My mom usually brings back expensive Korean farmed chili powder every year when she goes to Korea or has it shipped from her friend in Cali where they import it directly. As for the Korean labeled bags you see at the grocery store, almost 99% are sourced from China. I check the labels religiously when I go Asian grocery shopping and I have noticed that a lot of staple items are sourced from China, from produce to dry goods. I must report, I couldn't find one bag of Korean farmed chili powder the last time I went shopping at my extremely well stocked store. Personally, I appreciate that the writer offered up substitutes because I am always forgetting key ingredients on my grocery runs. I find in cooking all ingredients are flexible if you make and/or receive it with love. I see your point, Simin. 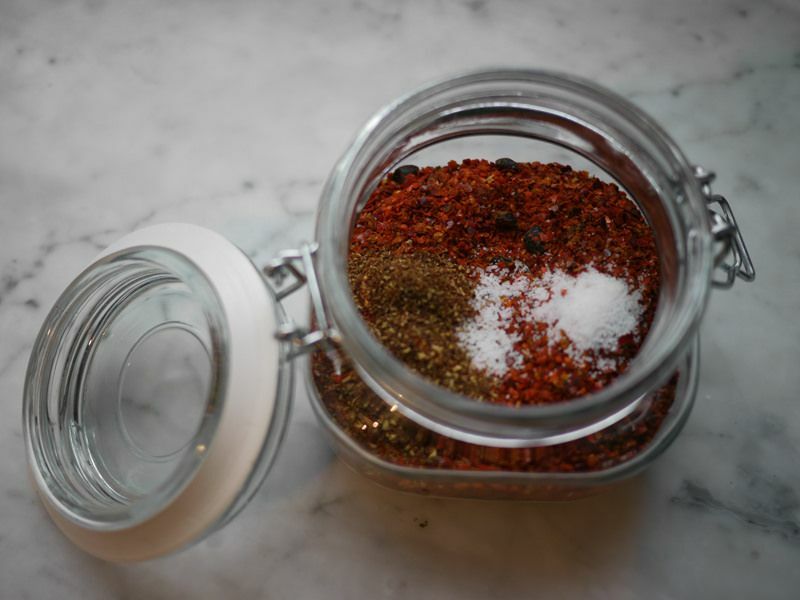 Before the editing process, the recipe specified Sichuan OR Korean chili flakes and ground, roasted Sichuan pepper OR five spice. But Sichuan pepper is optional because not all Sichuan food is mala. Some is just "la" (hot). Thanks for your note! Taylor - Thank you for sharing your recipe, it looks delicious! I've been making chili oil for years and I've learned that homemade is so much better than store bought. I hope you know you what are doing. Or saying. This has nothing to do with "Sichuan". I lived in the Shaanxi province of China for 6 months teaching english and this looks exactly like a sauce used there. Soooo good, I can't wait to try this. 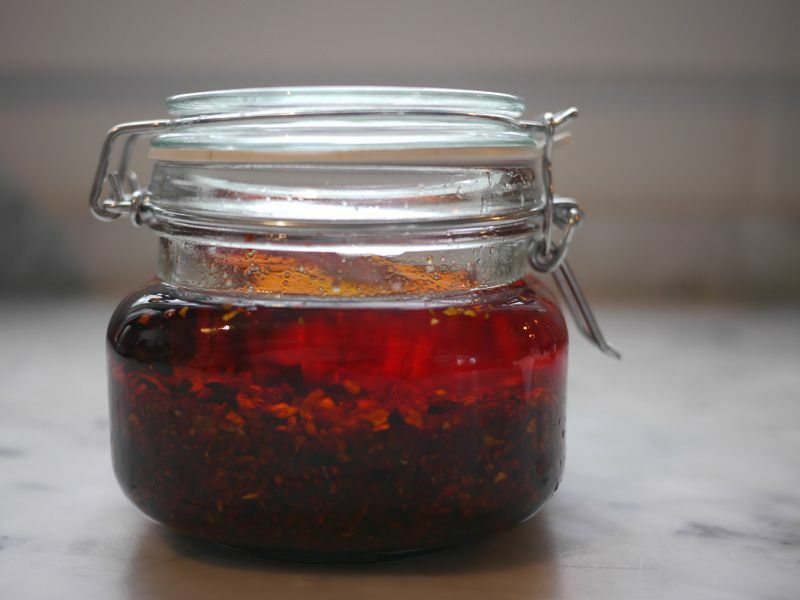 Frankly, this is a good hot chilli oil recipe but the term "Sichuan" may indeed be a stretch. For starters, a "proper" Sichuan mala (spicy AND numbing) recipe would include the use of Sichuan peppercorns, which gives the "ma" in "mala".